Woman Talking Hi. 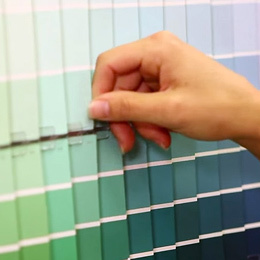 I'm Noelle parks interior designer and welcome to Dunn-Edwards paints how to paint video series. Now you may know that paint comes in different degrees of glass from flat to shiny, but how do you choose the one that's right for your project? Well in this video we'll review the different types of glasses so that you can pick the one that's right for you. First let's get an understanding of what glosses glass is about shine and the amount of light reflected in the paint if a painted surface is smooth and shiny like glass then it's a gloss, if the paint has a matte finish with no light reflection it's flat. Paint Finishes Dunn-Edwards offers a complete range of gloss levels. Each gloss level serves a specific purpose and works best for different areas. For example a flat finish has the least amount of glass so it helps to conceal surface imperfections better than other finishes and is ideal for walls and living rooms and family rooms it's also great to use for ceilings because of its flat appearance. Gloss Levels and Usage Stains however can be difficult to remove from flat finishes so it's best to use flat paints in areas I do not experience a lot of traffic such as hallways. The bill that finishes resemble flat paint when viewed head-on however when viewed at an angle there's a slight sheen this slightly higher sheen provides for a more washable surface and is ideal for areas with high traffic such as hallways or a child's bedroom. XL paints are one step closer than velvet paints and give off a greater warmth in depth to the surface and flat paint eggshell also tends to resist stains better than flattened velvet paints and is great for hallways. Low Sheen finishes are similar to eggshell finishes but usually have a slightly higher gloss they, are a good choice for areas where some glass is desired but good cleaning properties are also necessary such as in hallways bathrooms and kid room. Semi-gloss paints have a slightly glossy appearance and are less reflective than glass paints they offer a good stain resistance are easy to clean and are best for areas that require lots of scrubbing such as in a kitchen or a laundry room or a bathroom. Semi-gloss paint is also a good alternative to gloss paints for all your woodwork in your house, for instance your windows, your window trim, your doors and cabinets. Glass finishes have a highly reflective appearance they are tough durable stain resistance and easier to clean and lower glass paint glass paint are best used in bathrooms on doors and cabinets where you're exposed to fingerprints and grime. Woman Talking Now here are some general things to keep in mind about gloss. Gloss paints can highlight surface imperfections so inspect your walls as you consider what glass to use. Color will appear richer and brighter and higher gloss paint, also higher glasses will have better wash ability but be careful the higher the sheen the more likely it will highlight surface imperfections, a flat finish will hide them. For more information about Dunn-Edwards glass levels may be found online at Dunn-Edwards.com or just ask for a glass level guide from your neighborhood Dunn-Edwards paint store. 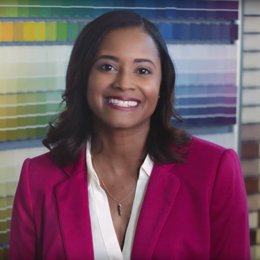 To learn more about paints in painting watch other how to paint' videos at Dunn-Edwards.com forward-slash videos for Dunn-Edwards paints. I'm Noelle Parkes thanks for watching and happy painting.